酒 (Sake) Means Liquor! Not "Rice Wine"! Many people think that the Japanese word "Sake"（酒）means Japanese Rice Wine. Nihon Shu, is the standard image of a "small ceramic bottle and shot glass / tiny plate". 1. Beer（ビール）= 80% of beers are usually Lagers. Hard to find Ale and Pilsner types. 2. Shochu（焼酎）= Similar to Vodka, but usually 20% - 25% alcohol content. 3. Nihon Shu（日本酒）= Liquor made from rice. 4. Ume Shu（梅酒）= Plum wine. 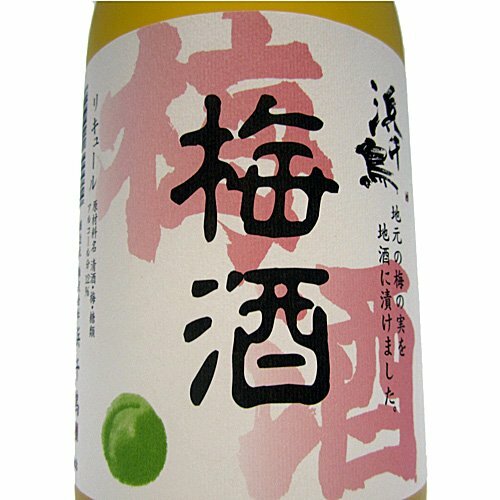 Japanese SAKE from Iwate, slightly sweet Plum liquor, Hamachidori brand, brewed by Hamachidori, 720ml, 12% Alcohol.